Poet Laureate nominee Charles Bane Jr. reviews The Summer Sacrifice. Why am I excited? Because I’ve written a book, and I feel like I’ve written a book. Is it because I typed THE END? No. Is it because it has gone through I-haven’t-got-enough-digits-to-count-how-many revisions, and now I feel like it’s bona fide? It has, but no. Is it because other people’s eyeballs and brains have now encountered it? Not really. My beta readers have been wonderful, but though they have asked important questions, they are not the answer to this one. So… why does this book, that has gone through so many different mini-completions, now feel more finished than ever? Because The Summer Sacrifice is getting clothes. I’m not sure why the process of getting a book cover makes the book feel more real, but I suppose I am one step closer to the final wave-off. If my book was a character, it’s gone from being a baby full of promise, to a little ugly duckling finding its place in the world, to something fully formed. And now that fully formed duck/child has (nearly) got itself some threads. The thumbnails above are precisely that. Thumbnails. They are works-in-progress; nearly-not-quites. And yet all three of them are beautiful in their own right. And all three capture an essence of my world. Thank you David Revoy! On the search for a cover designer, I visited the website deviantART. I scoured hundreds of artists, found a few who did beautiful work that would be suited to my fantasy book, and sent off some emails. I was over the moon when, a few days later, my first choice emailed me back and said that he could do it: French artist David Revoy, AKA deevad on deviantART. David is not only super-talented, but also conscientious and thoughtful. A storyteller himself, he wanted to really get a handle on my world before beginning to paint. And these thumbnails (along with some other goodies which I shall be revealing later) are evidence of his thoughtfulness and skill. I can’t wait to share the finished cover when it’s ready. Until then, take a look at David’s Art! Previous PostFreestyle. (My style. 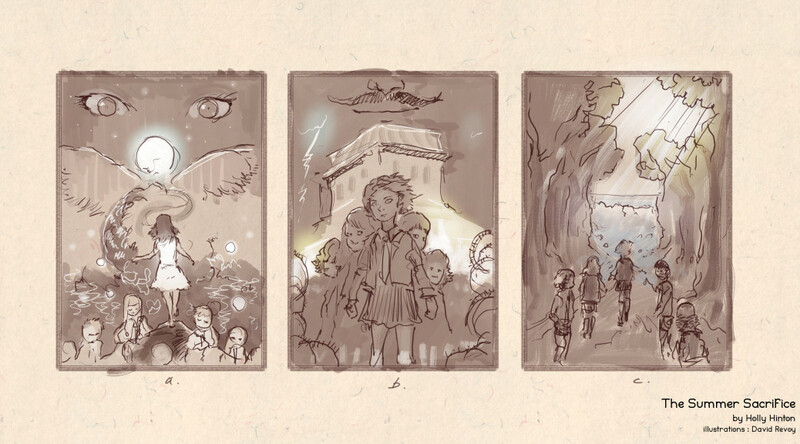 )Next PostThe Summer Sacrifice has illustrations. Sneak peek! Subscribe to this blog and you'll receive notifications of new posts by email.